The Scottish countryside turned out to be a sight pulled directly from a Hollywood film. Lush green rolling hillsides, with sheep roaming around large pastures as bubbly brooks run through the middle! Driving along, every so often a castle would appear in the distance- not something that happens back home in Canada and not something I ever tire of seeing! Traveling around Scotland by bus turned out to be a great way to see the Scottish countryside. It’s also incredibly cheap as my 4 hour Megabus trip from Edinburgh to Inverness cost only 5 pounds! In Inverness, I stayed at the Inverness Student Hostel. It’s an adorable old building, located just up the street from Inverness Castle with a great view of River Ness and the surrounding city. 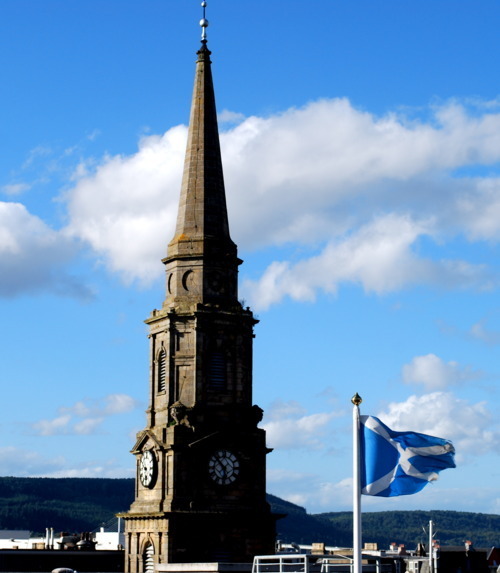 Inverness is the largest city in the Highlands and while it is quite a lot smaller than either Edinburgh and Glasgow, there is still a good little shopping district with lots of places to pick up souvenir tarten scarves, kilts and Scottish shortbread. After walking around a good part of city, my growling stomach convinced me to put my camera down and find somewhere to eat. I wandered into a little pub, mainly because I could hear “Any Dream Will Do” from Joseph playing from the street. 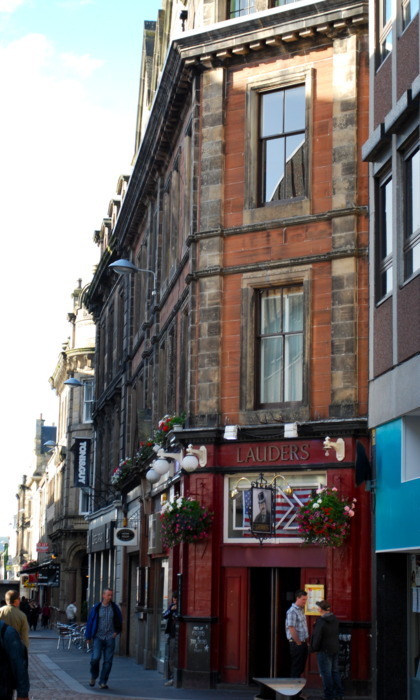 “Lauders” isn’t much to look at but the cheap beer, fish & chips and the friendly bar manager, with a thick highland accent who kept calling me darling (as everyone around here does!) made this dive bar worth wandering into! 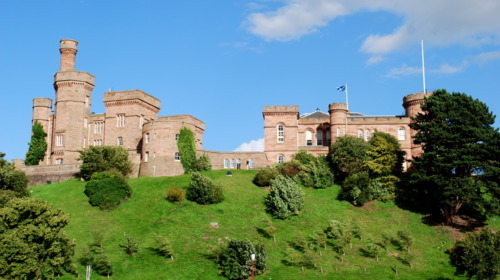 Inverness Castle stands high on a hill, over looking the city and the River Ness below. This hill has had a castle on it since the 12th century, although there have been a series of different ones replacing those that were destroyed in a battle or seige. 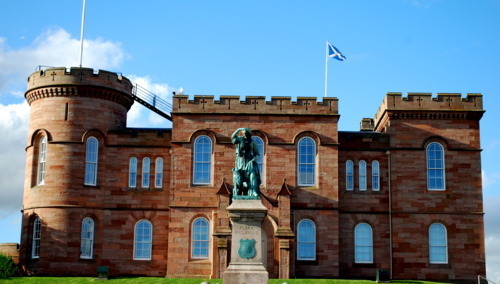 Inverness Castle was often the target of attacks because any army that held Inverness controlled all the important routes to the North, South, East and West. Over the years, English and Scottish Kings, Queens, Lords, Chiefs and Jacobites all fought for control of it. The castle still stands today but it was converted into a courthouse in 1830 when the latest castle was built. Out front stands a huge statue of famous Scottish Jacobite, Flora MacDonald, which has been there since 1899. Inside the hostel was a list of Famous Inverness Facts- Here are a few of my favourites! *Inverness is the capital of the Highlands. 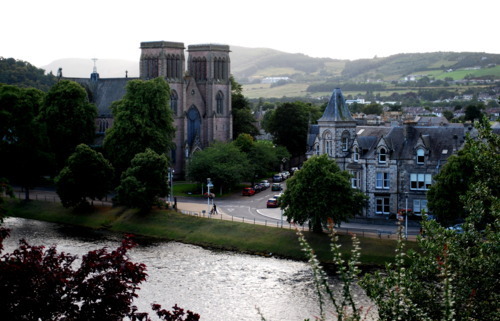 *Inverness only became a city in 2001 when it was awarded city status by the Queen. 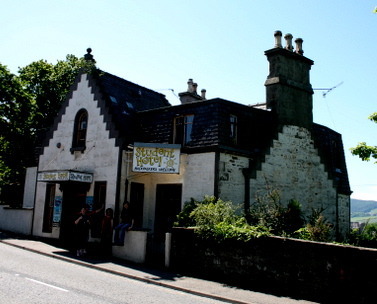 It is the smallest city in Scotland. 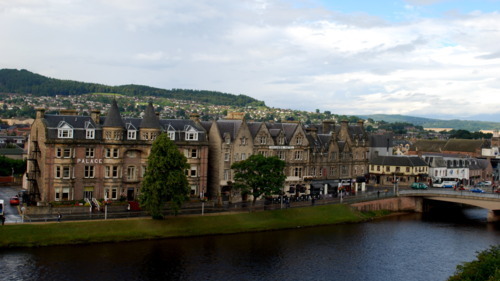 *Inverness and the surrounding area has the second highest concentration of red hair in the world. *Inverness residents are entitled to a free set of bagpipes on their 10th birthday according to a bylaw dating back to the 1750s.